Located at Inverness Airport Business Park, it will officially start operations on Thursday, August 9. The 12,000sq ft development will be home to 50 Co-op employees moving from an existing distribution centre.. Co-op logistics director Andy Perry said: “We’re thrilled to be able to launch our new site at Dalcross. “It’s a modern and future-proofed facility which is perfectly placed to support the Co-op’s ever-growing operations in Scotland. “Our significant investment in a new distribution centre is also a symbol of our absolute commitment to serving communities in the north of Scotland, as well as a strong indicator of how well our food business is performing in this area. The move is part of a wider £28m expansion and renovation plan that includes opening 18 new stores throughout Scotland before the end of the year. A Co-op spokeswoman said: “Since last September, the number of workers at the current depot has risen from 40 to 50, mainly due to natural growth. 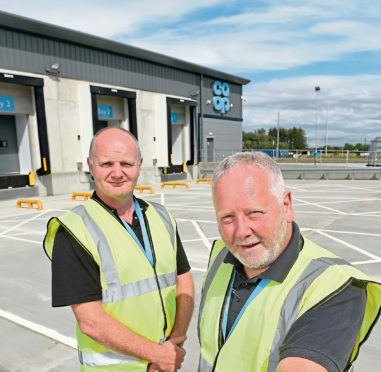 Inverness Airport Business Park chairman James Campbell said it was “delighted” to welcome the Co-op to its new address at 1 Vallance Road. He added: “The speed at which this development has progressed has been hugely impressive, with the Co-op’s project team only arriving onsite in October. Mr Campbell said the delivery of strategic infrastructure needed for phase one of the business park is now complete.